Macworld Lab recently tested a configure-to-order (CTO) 13-inch MacBook Air, set up as what we call an “ultimate” configuration with upgrades to the processor, RAM, and storage. But since that story ran, we've heard from readers who want to know how a similarly outfitted 11-inch MacBook Air compares. I'm not sure if those readers think that the 13-inch MacBook Air is too big, too heavy, or too expensive, but we bought and tested an ultimate 11-inch CTO MacBook Air to get them some answers. This CTO 11-inch MacBook Air takes the standard $1199 system with a 1.3GHz dual core Core i5 processor, 256GB of flash storage, and 4GB of RAM and boosts the laptop with a faster 1.7GHz dual core Core i7 processor (an additional $150), 8GB of RAM ($100) and 512GB of fast flash storage ($300), for a total price of $1749. The processor, RAM, and flash capacity of the CTO 11-inch configuration are identical to the specs of the ultimate CTO 13-inch MacBook Air previously profiled. That 13-inch model costs $100 more, due to its larger display and higher battery capacity. As you’d expect with such comparable systems, the two CTO configurations performed very similarly. 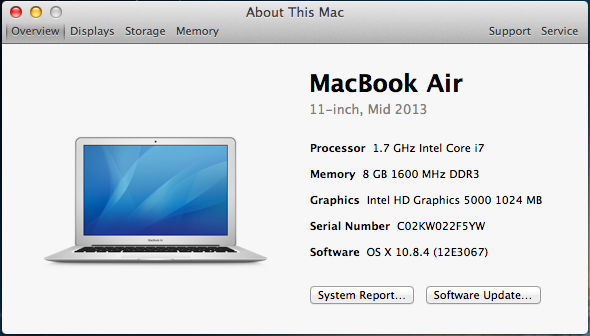 In fact, just one point separated the two CTO MacBook Airs in our overall system performance benchmark suite, Speedmark 8. Most tests finished within a second or two of each other. The CTO 11-inch MacBook Air was 24 percent faster overall than the stock 2013 11-inch model we tested. Photoshop tests finished 17 percent faster with the CTO Air. iPhoto and Aperture were 25 percent faster and the PCMark productivity suite was 31 percent faster running under VMWare Fusion than the stock 11-inch 256GB MacBook Air. We also compared the CTO 11-inch MacBook Air to last year’s stock 11-inch MacBook Air with its 1.7GHz dual core Core i5 Ivy Bridge processor, and found the new Haswell-based MacBook Air to be 36 percent faster overall thanks to the new model's faster integrated Intel HD 5000 graphics and faster flash storage. The CTO 11-inch MacBook Air was also 8 percent faster overall than the 2013 13-inch Retina MacBook Pro, again due to the MacBook Air’s faster graphics and flash storage. The Retina MacBook Pro was faster in a number of tests, including Handbrake, Cinebench CPU, iMovie import and iMovie export tests. As we saw in the battery tests of the standard 11-inch and 13-inch MacBook Air and the CTO 13-inch MacBook Air, the 11-inch systems (with lower battery capacity) don’t last as long on a single charge as the 13-inch models. While the new 13-inch MacBook Airs were able to last over 8 hours in our movie playback test, the 11-inch models last just over 6 hours. The CTO systems’ battery results were very similar in the video playback tests to the stock MacBook Airs. We saw a bigger difference in our battery tests using the Peacekeeper benchmark, a very demanding test. The CTO 11-inch MacBook Air lasted just 3 hours and 28 minutes, compared to 4 hours and 5 minutes for the stock 11-inch MacBook Air. Results are in seconds. Shorter/smaller results are better. Reference models in italics. Results are scores. Longer/bigger results are better. Reference models in italics. Results are frames per second. Longer/bigger results are better. Reference models in italics.